A friend of mine, Penny, who is also a former FWC manatee biologist, told me a compelling story of one particular manatee injury experience. 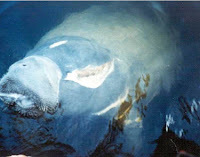 This story was a wonderful depiction of just what humans will go through to save a life of an animal that is dear to their hearts and an amazing story of one manatee’s ability to heal. 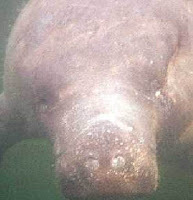 “Slash” was a manatee that had been severely wounded on his head and upper trunk region by a boat propeller. The wounds extended down to bone and his survivability was questionable… in the beginning. With the help of the Dolphin Research Center (DRC) located in Marathon, FL (licensed to respond to and rescue injured manatees in that area), “Slash” was documented numerous times with wounds that were healing. During these observations, he was otherwise displaying normal activities of a Florida Manatee. Each month, each year, Penny and DRC would “search for Slash” to determine his health status. Every time he was spotted they were amazed at his healing capabilities. The last time that “Slash” was documented was a chance encounter. Penny was in Key Largo searching for another injured manatee and happened upon “Slash.” She said, “The look that he gave when he turned his body towards me and I got the first glimpse of his face was one of pure joy and respect along with instant recognition. 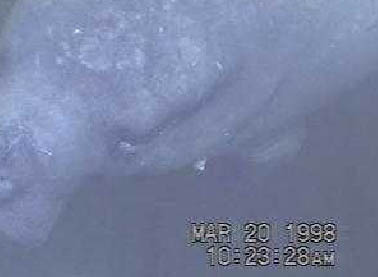 That this manatee could completely heal from wounds of this severity was amazing. He became our poster manatee of what not only manatees must go through but also of their amazing ability to cope.” When Penny showed me the photograph of this encounter, there was no question, I had to paint “Slash” and get this story out there. 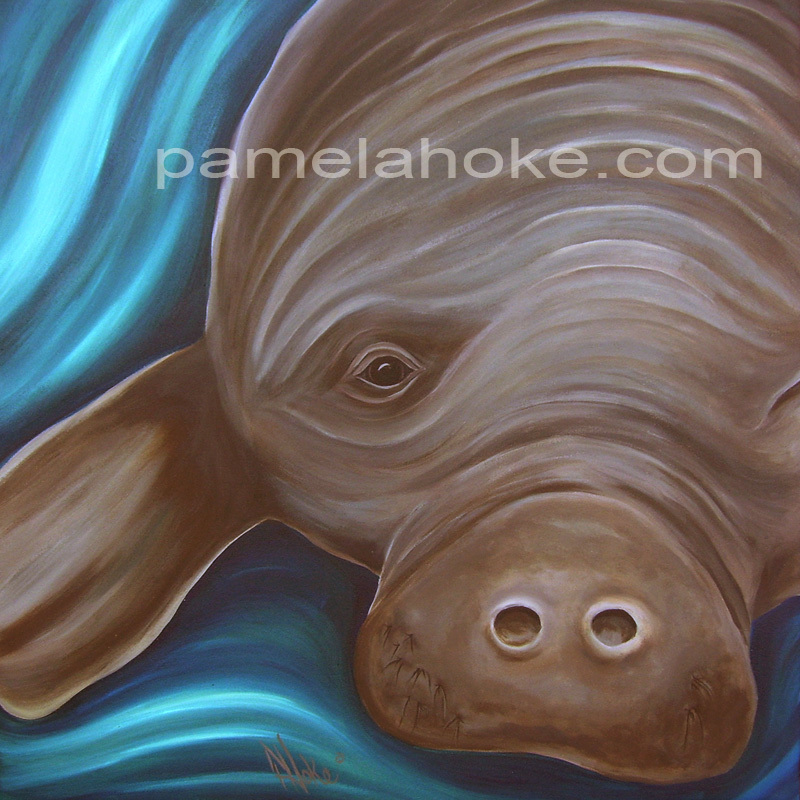 Dolphin Research Center will receive 20% of the proceeds from “Searching for Slash” print sales to help with their manatee rescue programs. Prints are available at my online store. 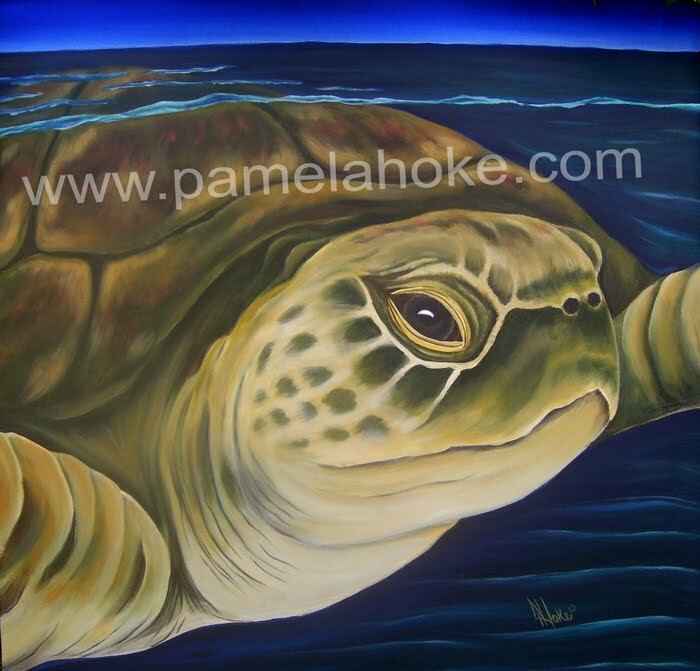 Not surprisingly, the original acrylic of this piece now resides permanently with my dear friend Penny!